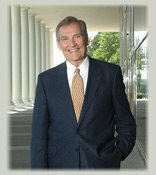 Further to yesterday's post regarding the homecall of beloved pastor and radio/TV preacher, Dr. Adrian Rogers, please check out Albert Mohler's tribute to this godly man. I'll miss Adrian Rogers! Perhaps his ministry will continue on like that of Dr. J. Vernon McGee. He, being dead, yet speaketh!